Rocky Balboa and Luke Skywalker. Typically you wouldn't associate the two characters, but within the span of a single month the two film franchises made roaring comebacks by following similar storytelling paths. Despite being continuations of old characters while introducing new, fresh faces, many are referring to these new films as "soft reboots" because they use extremely similar beats that worked their magic over audiences oh so many years ago all over again. For some this is a deal breaker, words being tossed around from "lazy" all the way to "plagiarism". For me, much like with Star Wars, it's magic. Yes, when you watch Creed you may have some thoughts travel through your mind regarding how familiar it feels because it does. The story of a young boxer trying to make a name for himself in a world that simply doesn't take him seriously. 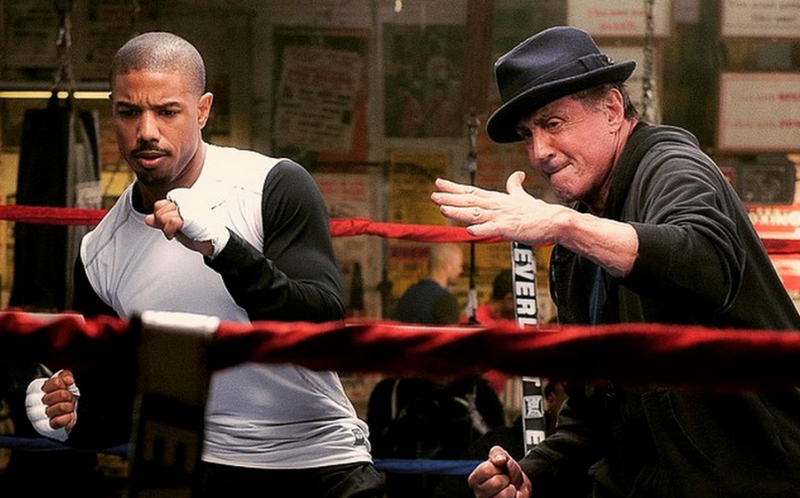 An elder, grizzled veteran of the sport taking him under their wing for training, only in this case you sub out Burgess Meredith for the warm bath of nostalgia that is Sylvester Stallone's Rocky. A love interest subplot for the new fighter, a young lady that can't help but look away when the ferocious punches are landing over and over. A finale that, on paper, was never supposed to be so grueling, a champion that walked in brimming with too much confidence only to find out his opponent will not go down without a fight. It's been done before. So what? Much like I believe with The Force Awakens, it's been nearly 40 years since Rocky first took the ring. Go ahead and do it again. Deliver those same beats to a new world, a new audience of people including myself that never got to experience such a work on the big screen. Just do it right, make the audience fall in love and feel something all over again, and that is exactly what Ryan Coogler did. Not yet a household name (but it's coming and it's well deserved) Coogler was the man who burst onto the scene with his feature length debut Fruitvale Station, a heartbreaking film released right at the onset of an unfortunately real zeitgeist, when the world started to pull back the curtain on the overwhelming, out of control power of the police and the many egregious crimes they have committed against minorities only to barely get a slap on the wrist as punishment. The film tells the painfully true story of Oscar Grant, a 22 year old that would lose his life on New Years Eve 2008, and Coogler demonstrated real, raw skill behind the camera. When I heard his follow up to that film would be a sequel to the Rocky franchise, I must admit a part of me was bummed. To go from such an interesting and thoughtful debut to just another tired attempt to bring back a franchise that seemed to have long since passed away, save it. Uninteresting. I was thrilled to be proven wrong. Coogler directed the hell out of Creed, utilizing some nifty camera work along the way that wowed me, including a delicious long take fight sequence that has us zooming in, out and around the ring like we are a part of the action. It's absolutely glorious stuff. 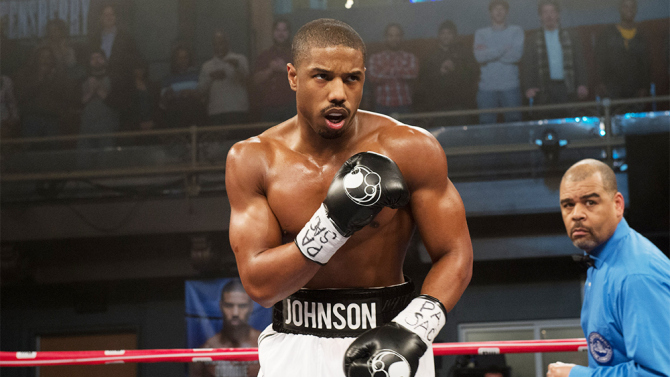 On a performance level, Michael B. Jordan is rock solid in the lead role as Adonis Johnson, the son of the late legend Apollo Creed. 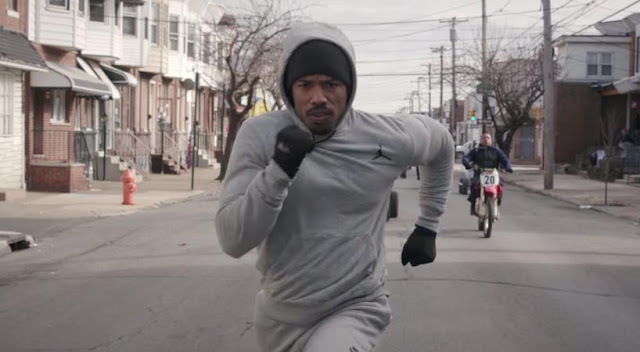 Obviously Jordan has developed a strong working relationship with Coogler, being that he starred in his first film Fruitvale Station as well, and sure enough he was the perfect choice to step into this ring. The knock your socks off performance from the film though comes from Stallone, a turn that is not only worthy of an Oscar nomination, it would be criminal not to see his name among the top five supporting actor possibilities. Throughout the film he is wonderful but there is one scene in particular that brought a tear to my eye and left me speechless, an emotional moment that he plays with such measured strength it felt astonishingly real. Not overdone and not under either, just a perfectly honest and authentic look at a man who has fell victim to the inevitability of time, a man who had to say goodbye to the love of his life. Creed is a smooth, entertaining ride that knows exactly when to jab you and it hits your hard. A beautifully directed, excellently performed work that not only stands as an excellent piece of cinema from 2015, but leaves you with an irresistible urge to go back and experience the original Rocky again as well. Great review for one of the year's best. Many have claimed that it's "overrated" (something that gets thrown around far too much these days) but I know that for me personally, it's in my Top 10 for the year. I despise the term "overrated" because for me, it is a vague criticism that demeans the person who enjoyed it. Saying something is overrated is basically saying "Oh, you liked it? You're wrong". People rate things based on how they connect with the work, so if you love Creed you aren't overrating it...you loved it, plain and simple. Glad you did too. Not sure at this point where it will land on the year, but it's a terrific film and I appreciate the kind words. I keep hearing good things about this film. I have yet to go see it. Good article. You just have to be willing to accept that it is remarkably similar to the original Rocky, Deron. As long as that doesn't bother you, have a blast with it, because it is a wonderfully made film. I appreciate the kind words sir. Glad you liked it. I will share your review with Ryan's dad who I work with. He will enjoy the positive feedback. I appreciate the kind words and the share, Patrick. Thank you so much. You are welcome to tell his dad that his son clearly has a gifted eye for directing and I can't wait to see what he does next.